There are a lot of hostile jerks on the internet who are quick to insult the intelligence of people they disagree with. Not long ago, I encountered one of these shmucks. Scottie Westfall writes the Retrieverman blog which is an interesting one focusing on dog breeding, evolution, and genetics. He’s convinced recent genetics studies support his long held belief that the red wolf (Canis rufus) is nothing more than a hybrid between the gray wolf (Canis lupus) and the coyote (Canis latrans). I commented on his blog, suggesting how the natural history of this hybridization could have occurred beginning in the Pleistocene. My comment was consistent with the findings of the study he cited. I wasn’t disagreeing with his premise. A Shmuck on the internet. His response to my comment revealed blind hostility. He wrote that my “inability to understand the study and my parrotting of data it falsified was telling.” This would be a cleverly worded retort, if I had been in conflict with his opinion. But I wasn’t. It was obvious he didn’t understand what I wrote because I wasn’t even disagreeing with his conclusion. And his response implied that I was some how evil or an idiot simply because we supposedly disagreed about some obscure scientific controversy. On this same response thread he’s carrying on a long debate (92 responses and counting) with an ardent anti-hunter in which his tactic is to call her an “idiot.” What’s that say about his mentality and personality? Now, I’ve had time to read the literature in depth, and I’ve discovered the genetic studies are contradictory. Evolution is seldom black and white. Usually, there is quite a bit of gray area, and the status of the red wolf as a species is certainly an example of the uncertainty involved in determining when speciation has occurred. Scottie Westfall’s blog gives only one side of the issue–the genetic studies that support his opinion. I commented on his blog with a link to a study that contradicted the genetic studies he touts as conclusively supporting his position, but he removed my comment and apparently he’s decided to block all of my comments from now on. Because his blog tops google searches, I feel it’s necessary to offer both sides of this issue, so those researching this controversy can gain a better unbiased understanding. This 80 pound canine was recently shot inside this hog trap somewhere in Georgia. It’s black and had a white spot on its breast. 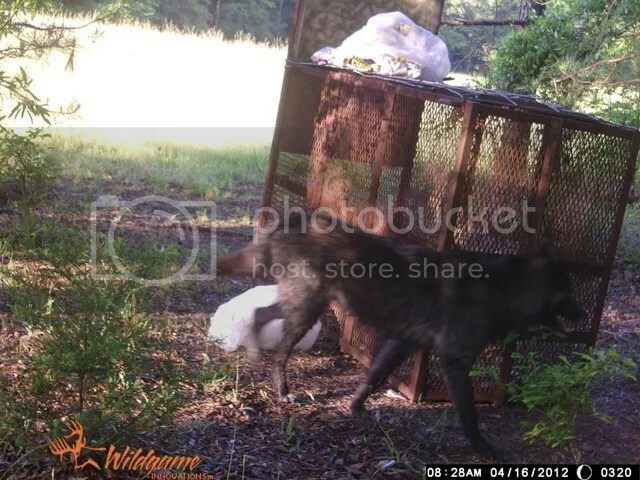 Another trailcam photo posted at the Georgia Outdoor News forum also photographed a black coyote with a white spot on its breast. Early colonists and explorers in the southeast noted that black wolves with white spots on their breasts were the common color variation of wolves in Georgia and Florida. I’ve also seen large reddish colored coyotes in south Richmond County Georgia. Supposedly, wolves were extirpated from Georgia and Florida by 1917. Did a population survive? Is it breeding with the recent influx of western coyotes or was the southeastern wolf simply a big subspecies of coyote? DNA tests are contradictory. All scientists agree that the remaining population of red wolves, now confined to the Alligator Wildlife Refuge in North Carolina, have at least some coyote blood. The final population of red wolves captured along the Lousiana/ Texas border had been reduced to such low numbers that they’d been breeding with the more abundant coyotes. Scientists chose those individuals with the physical characteristics most consistent with those of the red wolf and successfully bred them in captivity before releasing them in the North Carolina wildlife refuge which then was far away from the expanding coyote population but now suffers a coyote invasion. Biologists are attempting to trap and remove coyotes to prevent them from again breeding with red wolves, but I doubt they’ll be successful. About 20 years ago, R.K. Wayne of UCLA noticed an absence of genetic markers in red wolves distinct from those of coyote or gray wolf. He proposed that the red wolf was simply a coyote/gray wolf hybrid. A few years later, he examined DNA from 6 skins of red wolves killed in Arkansas circa 1900, and the evidence supported his proposal. A few other studies supported his contention, but other scientists were skeptical. They were suspicious of Dr. Wayne’s choice of specimens. They originated from Arkansas which bordered the historical range of the gray wolf and the red wolf. The specimens may in fact be from gray wolves, not red wolves. In 2000 Dr. Paul Wilson, a Canadian scientist, led a study of eastern Canadian wolf and red wolf DNA. He found none of the eastern Canadian wolf or red wolf DNA from specimens prior to the 1960’s contained gray wolf mtDNA sequences. 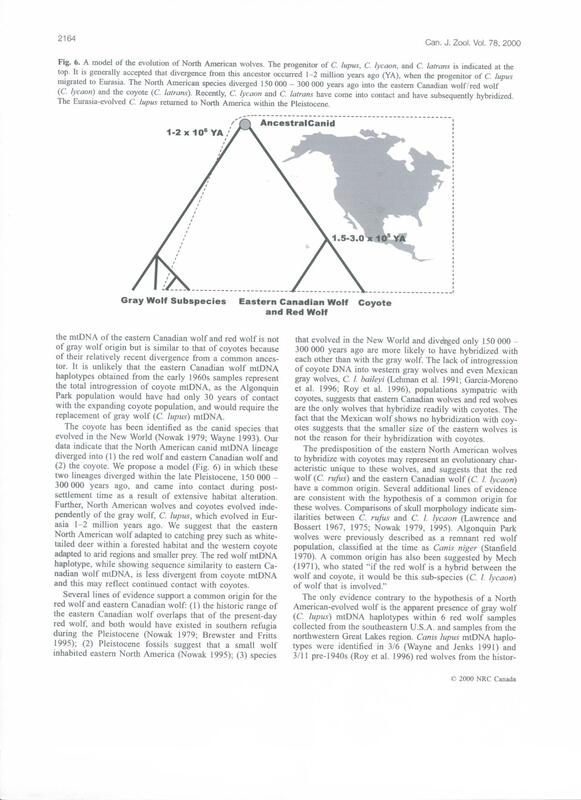 Moreover, there was a high degree of genetic affinity between eastern Canadian wolf (Canis lycaon) and red wolf mtDNA. He considered them the same species. In both wolves he found mtDNA control sequences more closely related to coyotes that are not found in gray wolves. However, both eastern wolves had specific unique haplotypes not found in western coyotes. So his study did find specific genetic markers unique to red wolves that were not found in gray wolves or coyotes–something Dr. Wayne didn’t find in his study proposing that red wolves were coyote/gray wolf hybrids. Below is his proposed evolutionary tree which is consistent with the fossil record. Dr. Wilson found a genetic divergence between gray wolves and eastern wolves of 8% which he calculated to mean they diverged from a common ancestor 1-2 million years ago. The genetic divergence between coyotes and eastern wolves is only 1-2% which he calculated to mean they diverged from a common ancestor 150,000-300,000 years ago. Coyotes have recently (within the last 100 years) come into contact with eastern wolves and have hybridized. Last year, scientists led by Bridgett Von Holdt used existing genetic data to create a genome wide analysis of worldwide canine DNA. The findings in this study directly contradict the findings in Dr. Wilson’s study, though it should be noted this study used the same contested samples of red wolf specimens that Dr. Wayne used. Dr. Von Holdt found no close affinity between eastern Canadian wolves and red wolves. They determined the current population of red wolves were 75%-80% coyote with the balance being gray wolf. So which study is correct? Who knows? I would like to see a study of DNA from red wolf specimens originating from 17th or 18th century Florida, Georgia, Alabama, and Tennessee. Evidence from such a study might resolve the controversy. I’m not sure a study such as I propose can be conducted. There may just be a shortage of readily available museum specimens. But I know of one. I recall a red wolf specimen with fur was discovered in Fern Cave, Alabama in 1970 along with much older remains of the giant short-faced bear (Arctodus simus). I don’t know who possesses this specimen but it should be genetically analyzed. I believe red wolves evolved from coyotes following the extinction of dire wolves. Coyotes were present in the Pleistocene southeast but eventually became absent. I formerly thought red wolves drove coyotes out of the region, but now I think eastern coyotes grew bigger to exploit a deer-hunting niche left vacant when dire wolves became extinct. Whether or not they’re a distinct species, a large subspecies of coyote, or a coyote/gray wolf hybrid is debatable?